With less than a week to go, all eyes are on the mid-terms and the potential the Democrats will take back the House. We wanted to share what we are reading and listening to in order to stay informed about this election. I don’t think I should have to say this, but if you aren’t reading FiveThirtyEightand Nate Silver, you really should. Their blend of data journalism, models, and a mathematical view of the situation cuts through the noise and punditry that dominates the vast majority of the news. With a model for the House, Senate, and governors races you can see both how the races are shaping up, as well as what factors are creating the environment. Interested in how polling actually works? The Upshot has been polling races and producing results in real time, letting readers watch and see exactly what is going on. If you are the type that reads a lot about polls but doesn’t fully understand what they mean, take a dive here. There is no doubt the news media is having a major impact on the election. Every week Bryan Curtis and David Shoemaker breakdown the press’s reactions to major stories and what that reaction means. You cannot understand the election without taking a long look at how stories are being covered. 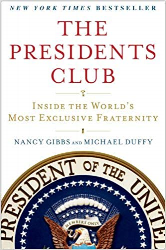 This week Mike is recommending "The Presidents Club" by Nancy Gibbs. "This book is a detailed history of the relationships between American Presidents, including before, during, and after their presidencies. We learn about Dwight Eisenhower’s influence in helping Ronald Reagan enter politics, the rivalry-turned-friendship of Gerald Ford and Jimmy Carter, and Richard Nixon’s secret role as a foreign policy adviser to Bill Clinton. The book is a great read for lovers of history and is filled with fascinating stories of serious diplomatic missions, stealthy political maneuvering, and amusing club reunions."